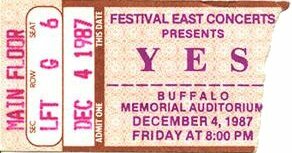 This was my first YES concert! I was a junior at the University of Buffalo. While I have to admit that I have a sentimental weakness for the BIG GENERATOR album, the set list, which consisted of very little '70s material, left me feeling a little cheated, especially the condensed version of "Roundabout". Whose bright idea was that anyway??? Thankfully, it was not to be my last YES concert, and things would only get better. Now c'mon Talk was a "sloppy" tour not this one!!. 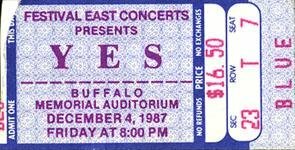 I just remember making the trip down from Canada on a cold snowy night and having great seats to the side of the stage. Close Enough to see Trevor's Guitar Tech busily preparing and tuning each guitar and getting Trevor's bottle of beer ready. I thought the performance at this concert was excellent, especially Trevor's re-working of Howe's "Yours is no Disgrace". The 90125 Yes was the first one I ever knew which made me a lot more accepting of the lineup and the new style than the veteran fans ever were. Big Generator tour was the low point of YES in my opinion, uninspired, loose and sloppy, Jon looked ready to fall asleep, Squire looked ill. Co-producer Paul DeVilliers, who I've known for years and who was doing the mix (in Buffalo at least) told me after the show that the band were squabbling and unhappy, were not playing well, and Rabin was being totally unco-operative in trying to achieve a good guitar sound through the P.A.